Old Fort has long been known as the gateway to the mountains, not least for its crucial role in opening Western North Carolina to rail traffic. In the late 1870s, engineers and laborers based in the town completed the dangerous and sometimes deadly work of laying winding tracks around peaks and blasting tunnels through hundreds of feet of rock, forging a route to Asheville and beyond. Like the railroad, Andrews Geyser has endured. Built in 1912, the man-made fountain which sits in a meadow encircled by railroad tracks about five miles west of town, turned 100 this year. In fact, its story dates back even earlier. 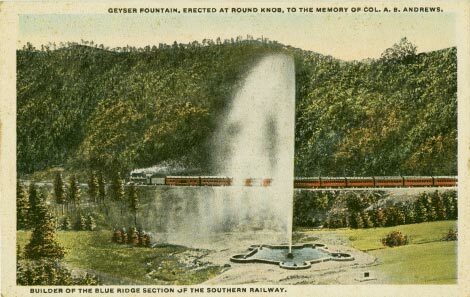 The geyser replaced a similar gravity-generated waterspout installed in 1895 on the grounds of the Round Knob Hotel. The grand, five-story hotel was a favorite stay among rail travelers until it burned in 1903.Afterward, the old fountain fell into neglect. Its demise pained George Baker, a New York banker and longtime board member of multiple railway companies. He was proud of the men who’d pushed the tracks through the mountains, especially his friend Colonel Alexander Andrews, vice president of Southern Railway from 1895 until 1915 and the man responsible for overseeing much of the work in WNC. Baker bought land 75 yards north of the old fountain and commissioned a new one, which he named to honor his friend. The spout was, and remains fed by water piped down from a pond on a nearby hill. The 500 feet of elevation change provides the pressure that drives the fountain, which can reach heights of more than 200 feet every few minutes. Through the years, the geyser’s fortunes have ebbed and flowed in seasons of disrepair and revitalization. Today, it’s well maintained by the town, which owns the geyser and a public park surrounding it. Still, during periods of low rainfall, there’s insufficient water to support a hearty spout, so town leaders are considering installing a well to keep the geyser gushing. Its centenary was marked on a sunny Saturday morning in September, when more than 100 locals gathered to pay tribute. The keynote speaker was Steve Little, mayor of Marion and the geyser’s unofficial historian. At the ceremony, Little read passages from his new book, Andrews Geyser: Star of the Mountain Railroad, which shares his findings from more than 30 years of research.